I often talk to customers and right away they tend to mention clarity. Don’t get me wrong…this is an extremely important factor when seeking a diamond, but it should be balanced along with the other 4 C’s, especially color. For the most part, diamonds will be 100% eye clean if they are SI1 or better. Of course, there are other factors that can affect this. Step cut diamonds, such as emerald cuts, have long facets that run the length of the diamond. It is my opinion that these diamonds are easier to see into and therefore an SI1 may or may not be eye clean. I tend to recommend VS2 for step cut diamonds. 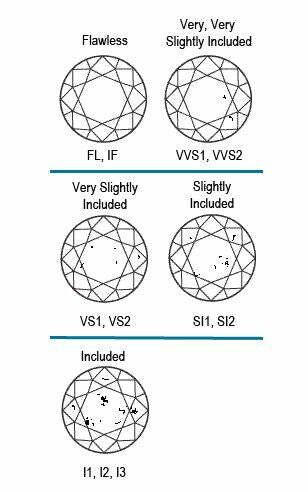 My point when speaking about clarity is that SI1 clarity and better diamonds will typically not have eye visible inclusions or inclusions that will affect the overall brilliance and sparkle in a diamond. You will really not see any difference visually unless you put the diamond under magnification. However, color is what you see when looking at the diamond. 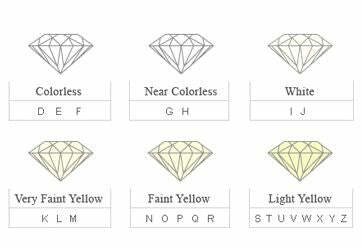 I have had customers before who want to purchase a VVS clarity diamond but choose a ‘J’ color. To me, this doesn’t make a whole lot of sense. As a graduate gemologist, I tend to encourage my clients to have more of a balance between color and clarity. I would rather recommend an H color VS diamond verses a J color VVS1. My thought behind this is that since you really can’t judge clarity without a microscope and you can judge color without a microscope, try to go for a slightly better color and lower the clarity slightly to stay within your budget.